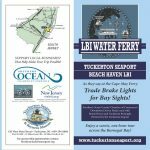 The Southern Ocean County Chamber of Commerce Downtown Driven program Water Ferry Committee with representatives of Borough of Beach Haven, Borough of Tuckerton, Tuckerton Seaport & Baymen’s Museum, Southern Ocean Chamber and Ocean County Planning Department proudly announce 2018 water ferry service officially titled “Tuckerton Seaport- Beach Haven Water Ferry powered by Southern Ocean County Chamber of Commerce” departing from Tuckerton Seaport and Taylor Avenue Municipal Dock in Beach Haven. The pontoon boat will seat 25 passengers in a comfortable and covered voyage departing Tuckerton Seaport and Beach Haven Taylor Avenue Dock. Initally the summer sailing was planned, but arrival of the customized ferry will launch a Chowderfest Express service running the festival weekend September 29-30, 2018 in conjunction with the Ocean County Decoy show at the seaport. There is no fee to ride the ferry this season. The committee released advertising and sponsorship donation information for 2018 which is available on the official website lbiferry.com.